We hear a lot of sounds every day, don’t we? It starts with the dreaded alarm in the morning. There are pings of phone notifications, the sizzle of eggs on a pan, neighbours scolding their kids and traffic of course. We buy noise-cancelling headphones and listen to our favourite music. But have we ever thought of our hearing as a gift? If not, this might make us see things differently. Carol Benjamin has two beautiful baby girls. Halie is older and Scarlet is 11-months-old. She took to Facebook to write this emotional post. She decided to get her hearing aids. And the results were too precious for words. Scarlet’s pure joy on hearing Halie call her “baby sister” moved their mom (and everyone else) to tears. This heartwarming video has since gone viral with some people saying they’ve watched it over 5 times in a row. 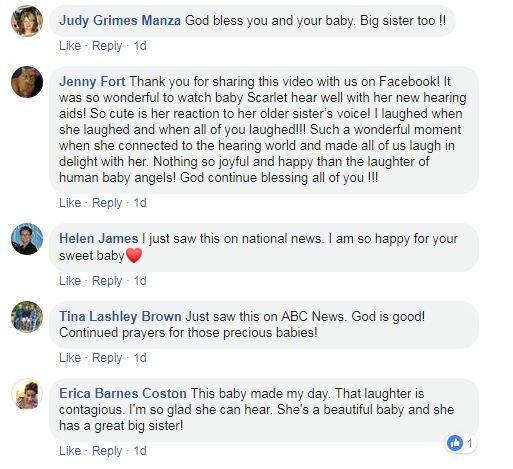 In an interview with ABC News, Carol talked about all the other sounds her baby heard next – “We took her outside and she was listening to all the animals and was freaking out.” Such a heart-melting reminder to count our blessings and never take them for granted.